The “Sisters” sculpture is one of four purchased to remain in Dow Gardens after the Zimbabwean sculptors in residence left. 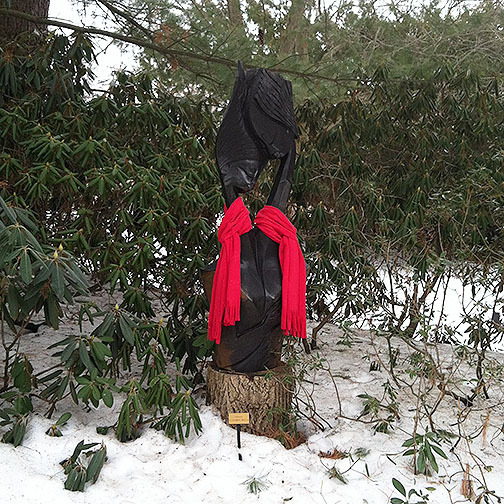 Week 3 of Butterflies in Bloom service began a little warmer, although someone thought the Sisters sculpture needed scarves. Stay on the path, it says. 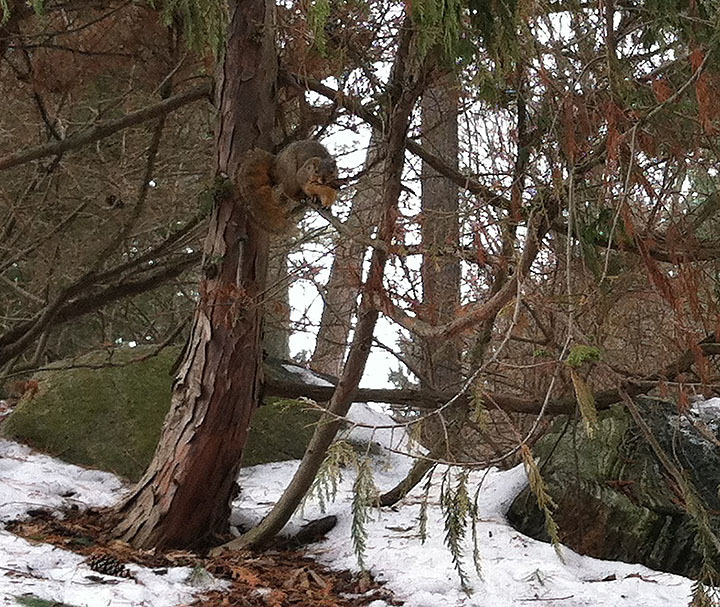 I haven’t seen any chipmunks or deer, but a squirrel was eyeing me closely. 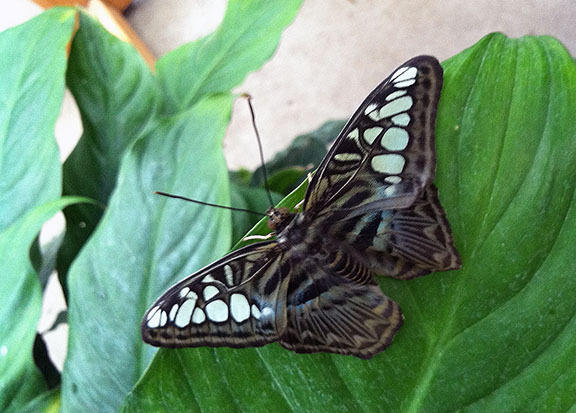 Inside the Conservatory, the volunteer going off shift told me that two visitors were waiting for a blue morpho to emerge … and waiting … and waiting. After I had been there half an hour, the woman wanted to leave but she was afraid it would come out as soon as they turned away. 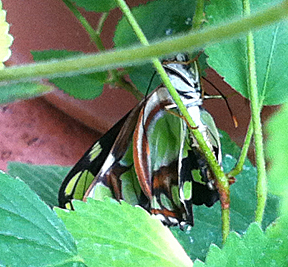 This blue morpho became stuck while trying to emerge. I told her that at this point, the poor thing was stuck and would not be emerging any further. 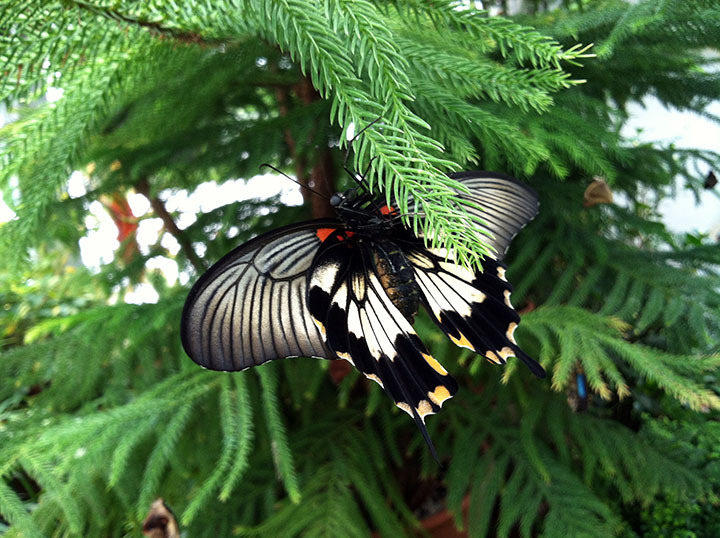 If a chrysalis falls from a shelf with a butterfly partially emerged, I’ll retrieve it, scrape the chrysalis away and hang the butterfly in our handy “hospital tree,” a Norfolk pine behind the emergence case. The undersides of the shelves, though, are so full and busy that I won’t interfere there. 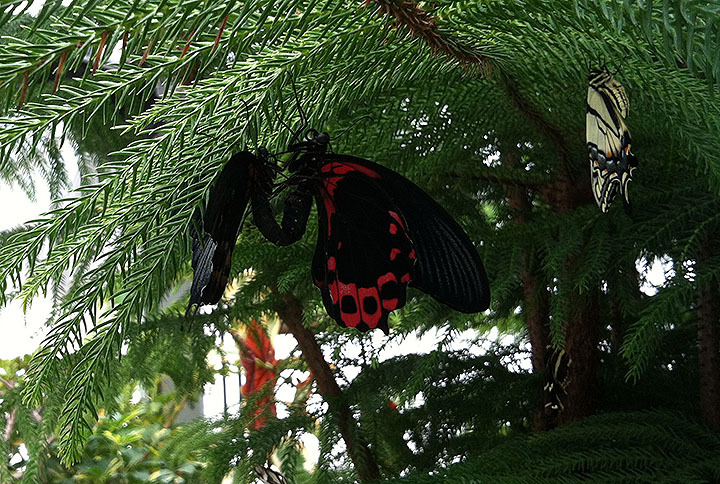 The Norfolk pine where we hang butterflies that need more time to dry. I try to put them high enough that if they fall, they still will be visible so they can be rescued again. 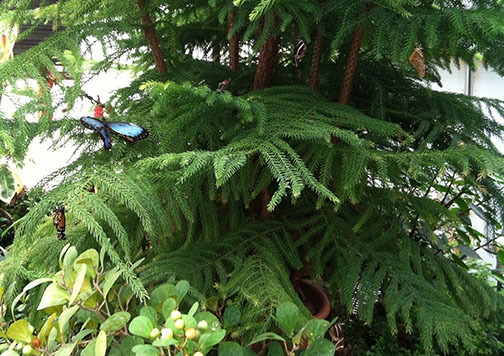 Speaking of the Norfolk pine, it got a lot of new residents while I was there. How many can you spot? A monarch. If I had to guess one butterfly that would be on this tree, it would be a monarch. 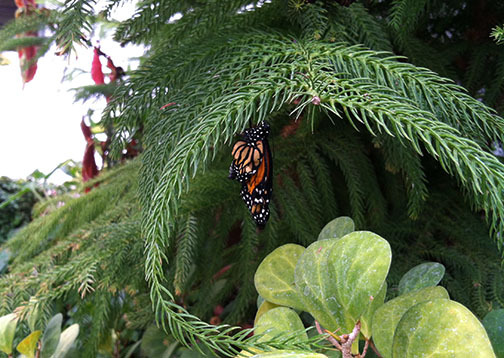 Here’s one of them, a monarch. I call them “beautiful and stupid” because they are notorious for crashing and needing rescue. I have no idea what this plant is. I’d like one, though. 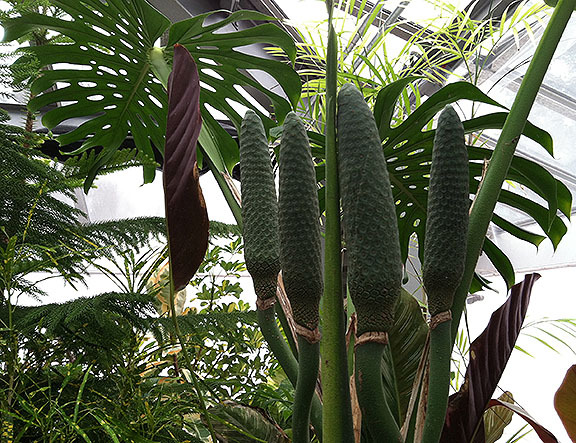 The Conservatory, by the way, is full of fabulous tropical plants. I wish they were labeled like the ones in the rest of Dow Gardens and plan to ask why they aren’t. I’d be happy to help tag. Two Julias and a great Southern white eat together. 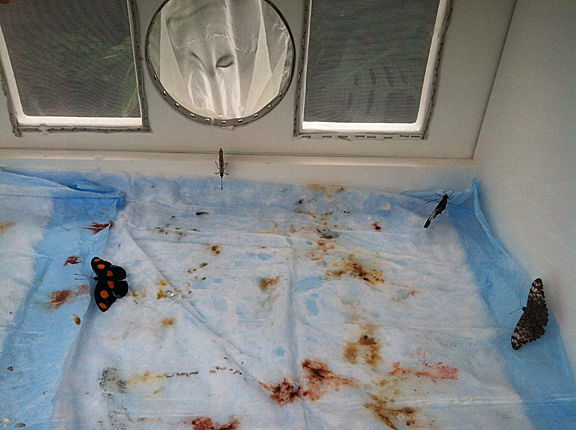 So far the butterflies have been relatively unmolested in the food dishes. 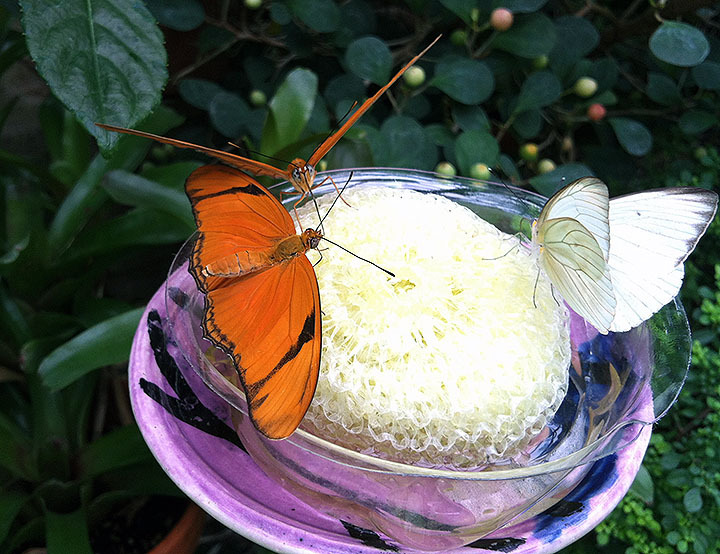 I’ve had a few children try to coax them onto fingers while they were feeding on flowers, and I point out that just like you don’t bother dogs when they’re eating, you should let the butterflies finish their meals. A scarlet Mormon resting and one that has other ideas. I also saw signs of mating behavior for the first time this week. The scarlet Mormon above was in the tree for a reason and needed more recovery time, so I was annoyed when another butterfly came around with other things on its tiny little mind. But their lives are short, so hey. There also was a pair of Julias mating, with another butterfly on deck, so to speak; we do see trios close together sometimes. As opposed to the first week, when the bitter cold outdoors made it difficult to keep the humidity in the Conservatory high enough, there were lots of new butterflies emerging, perhaps a dozen just in the two hours I was there. 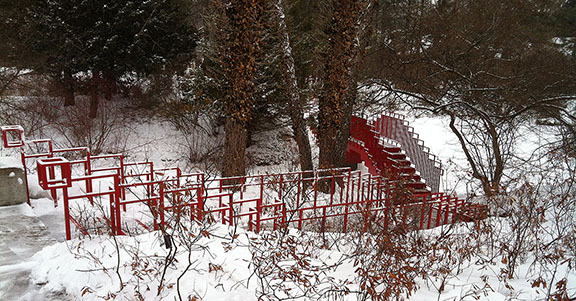 One of Dow Gardens’ iconic red bridges. 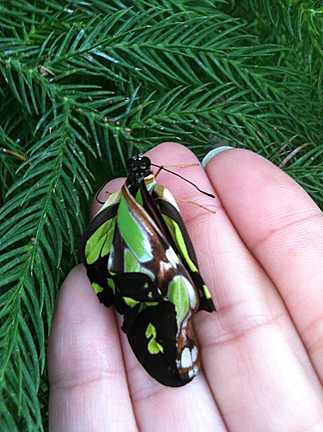 Sometimes even when butterflies are quite strong, they don’t go far after being released from the emergence case. This one decided that chilling on the case’s back door was just fine. 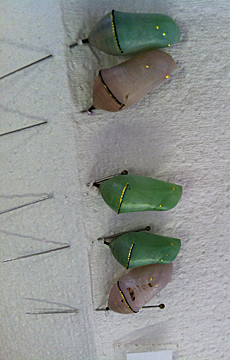 We had several blue morphos emerge, which made me happy because they are a visitor favorite. 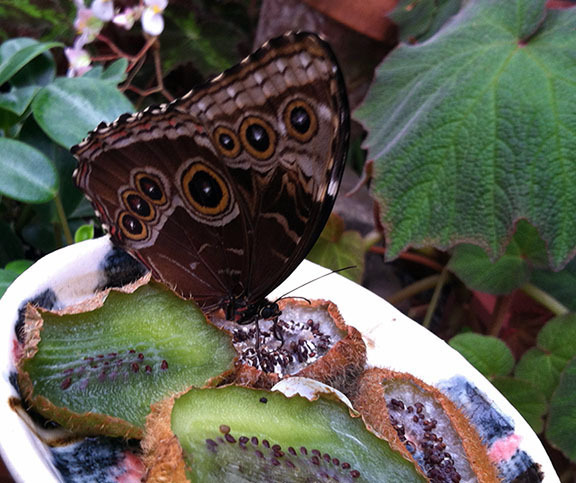 They are our largest butterfly; one is pictured above on a delicacy, rotting kiwi. When it opens its wings, the “top” sides are a beautiful blue. Some species take longer than others to be dry and strong. Swallowtails, like the one above on the Nordic pine in the nursery area, sometimes shake as if they are chilly. 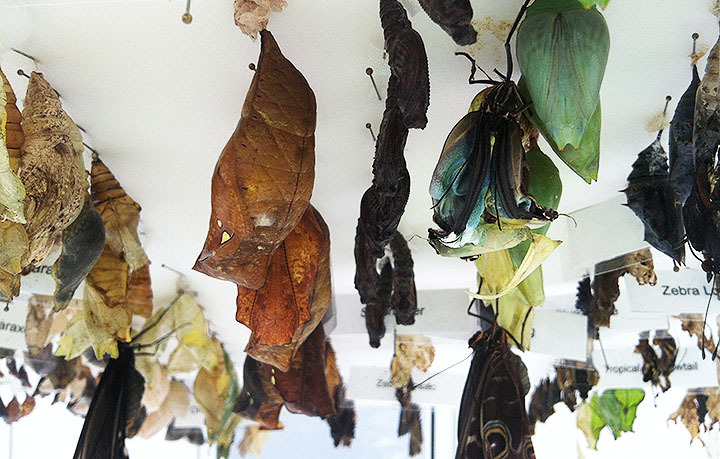 Monarchs are notorious for crashing and needing quick rescue, and the blue morphos are so large that they make take half a day before they are ready for release, while some small species are vigorously flying about inside the case in two hours or less. 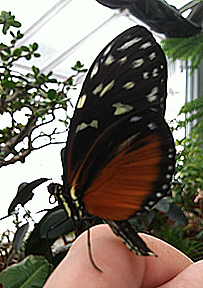 Every year, Dow Gardens in Midland, Michigan, hosts Butterflies in Bloom, a butterfly house that is unusual in that visitors are allowed to touch the butterflies. 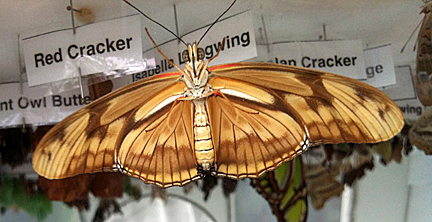 I am a butterfly caregiver, so here are some photos from last week, three days before opening. 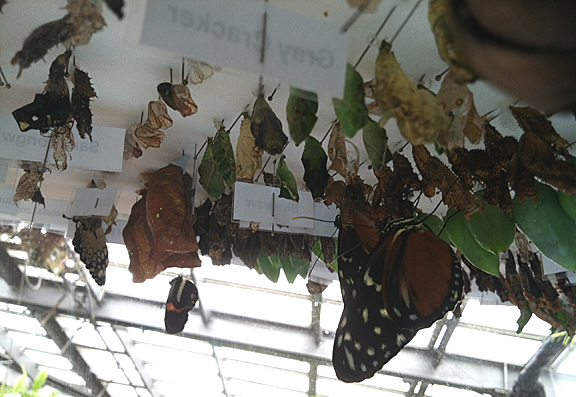 This case is home to all the chrysalids while the butterflies and moths grow and prepare to emerge. How do the chrysalids get there? They are pinned. Entomologist Elly Maxwell gets boxes that she opens inside a box with sleeves, then sorts the contents. She and volunteers then carefully pin them and add them to the case. There is much more drama than the wiggling and stretching creatures, though. One key task is inspecting the case for invaders — either from within, through parasitic wasps, or from without, through the tiny white ghost ants that pervade the conservatory. We are careful not to let any cords or leaves touch the case so ants can’t get across that way. When the case is not open for removing invaders or ready butterflies, it must be locked. The USDA would shut the exhibit down otherwise. 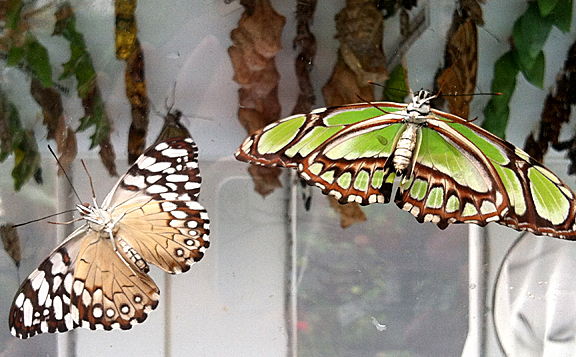 Visitors understand that live butterflies can’t leave, hence the two sets of doors. However, we also cannot let dead butterflies or even parts such as wings leave the building, no matter how much students or Scouts might beg. Plant material can’t leave, either, on the off chance it might have eggs on it. 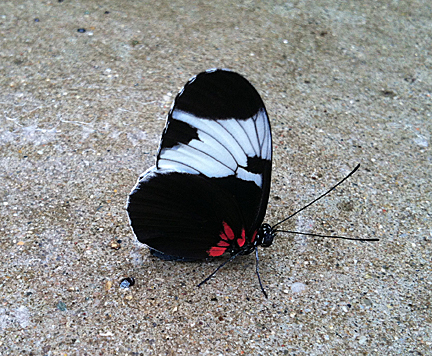 One of the jobs of a butterfly caregiver is to rescue crashed butterflies. Sometimes they fall from their chrysalids onto the moisture-soaked pads below. The case is lined with these mats because the inhabitants need about 93 percent humidity to develop properly. The red stuff isn’t blood, but meconium, which drips out as the insects emerge and pump fluid into their wings. This is a crasher. If a butterfly falls before its wings are ready, it needs to be placed somewhere it can attach itself and reorient hanging down to finish the process. I reached into the case, “tickled it under the chin” as Elly says, and waited for it to crawl onto my hand. 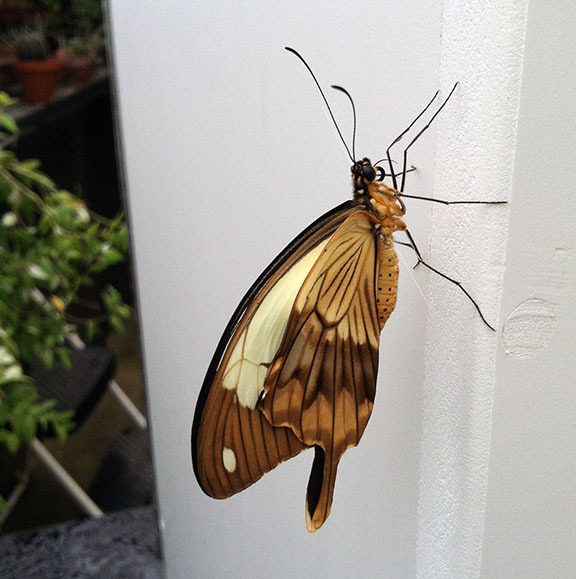 Just as butterflies like it humid inside the case, they like it humid in the conservatory, which can reach 90 degrees. 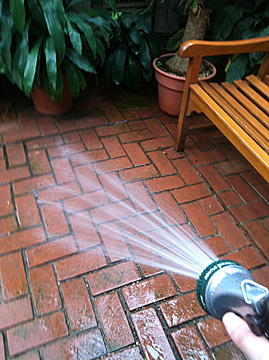 Hence, another critical butterfly caregiver task is watering the floor. Not kidding. When watering or even just walking around, you have to make sure you don’t dampen or trample one of the winged residents, which sometimes hang out on the floor. 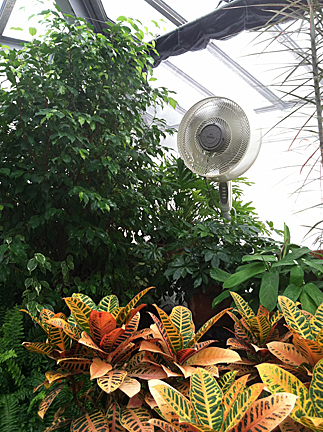 Misting fans also help keep the humidity up. 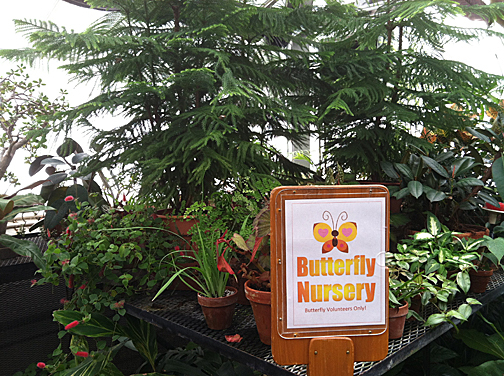 As long as visitors are careful, they are encouraged to interact with the butterflies. Remember that the wings are too fragile to touch. There are many species in this exhibit, including some from Asia and Africa, and if one lands on you, you are welcome to let it hang out there if you like.